Is Yoga and Martial Arts compatible? You may be thinking, Yoga and Martial Arts, how does that work? I often get this question or the strange look when I tell people that, being a Yoga teacher, I also practice Martial Arts. It is like if Yoga and Martial Arts were incompatible! The truth is that all these techniques, Martial Arts, Tai Chi, Yoga, they all have one thing in common: to lead the mind into silence! The goal of Martial Arts is not learning to kick and punch to hit other people! The goal is to bring the mind into quietness through the warrior’s path, by stimulating the values of a warrior such as honour, honesty and courage. The goal is to be able to control the mind under stressful or dangerous situations. By controlling the body we learn to control the mind! Each tradition has developed its own variations which aim at stilling the mind and reaching the silence within. Performed in the context of different faiths and techniques, they may differ in expression, but in essence they are one. Without the philosophy and spirituality, Martial Arts become a meaningless and dangerous sport! Tai Chi is moving meditation and Martial Arts in slow motion. I find it quite funny that some people seem to get shocked when we say that Tai Chi is Martial Arts. It is like if they felt disappointed as they thought that it was something else, something magic maybe.. However, Tai Chi is the purest Martial Art, and by practising those movements in slow motion they become a lot more refined and when used in the context of a combat, each movement is perfect and effective – “one step one kill”. But also the beauty of Tai Chi is that we learn to work with the energy of our body, what we call the “Chi”. And it is the slow movements and the energy created within the body that brings the calm and quietness in the mind. This is the part that people like to hear: Tai Chi with its slow movements brings serenity and inner peace, like magic. They don’t like to hear it is a Martial Art, but it is indeed. All these different techniques, either Yoga, Martial Arts or Tai Chi they are methods of purifying the nervous system so that it can reflect a greater degree of consciousness. So, in answer to my original question, yes, Yoga and Martial Arts are perfectly compatible. 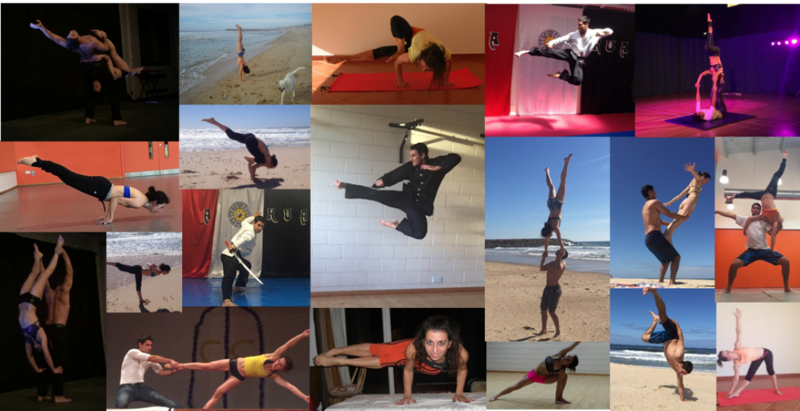 Yogi Kick teaches PaKua Martial Arts, Tai Chi, Yoga and AcroYoga. Categories: Martial Arts, Uncategorized | Permalink. The legend tells that there were eight immortals who devoted their time practicing meditation. Combined with ancient techniques of Chinese Yoga (Kai Men / Chi Kung) getting extraordinary abilities. By natural law they became experts in Kung Fu. They developed very advanced techniques such as the drunken style. They also worked the internal power to perfectly master the imbalance; they were eight great masters who dominated the control of energy (Chi Kung at its most advanced level). Inside this group there was a female monk who had good skills in handling all leg-techniques, developing the Martial Chi Kung. This style was brought to the Shaolin temple to be taught to advanced students after the Saholin destruction in which several monks escaped and hid in villages to not be recognised, and exchanged their names and dressed as beggars. In each village they left teachings that the villagers improved adapting to their customs and physical structures. Within these transformations, the southern drunken style of China, which is not as beautiful but very effective in fight ; at that time the Stick of the Southern Beggar’style is born – name given in honor of a monk who walked the villages pretending to be a blind beggar and handling his stick with great ability. The drunken style, improved with time and lost its essence due to being a difficult style to learn and perform, since a great physical, mental and spiritual preparation was needed to perform this task. This style stands out for its ability to deceive the enemy, mistaking him, using the imbalance, spins, jumps, dodges and acrobatics using the opponent’s strength. The techniques is used with the internal energy from the Tan Tien (waist force), hips and shoulders, which combine to launch a coup fists and legs followed by sweep kick. The purpose of this style is to keep our body in good condition to turn and store energy (Chi Kung) that is used in more advanced spiritual levels. To the practice of the drunken style is a set of highly refined techniques, and therefore, it is considered as the highest level of the physical plane. With practice, physical changes on the internal organs and endocrine glands are performed. Our body becomes a deposit of energy that elevates the human being to its highest level of consciousness. Through the exercises of Chi Kung we began to channel the energy and find the connection to the gland to develop the immortal fetus. The vital force of the practitioner depends on these glands; with the practice it increases the flow of hormones strengthening the immune system. The sexual energy (creative) improves cleaning and strengthening the organs. This is very important to have strong and detoxified organs; the practice helps to eliminate toxins, waste and convert fat into the roots of the connective tissue in energy (Chi Kung). Currently, there are modern styles of the drunken style which have simplified the old style to facilitate the learning. O jovem destruiu a espada contra a pedra e retornou ao mestre e disse: “Nada Aconteceu!